Every month DiScoro writes about resources that can be used in schools. Please, see the MENU under Services for workshops, training and other services. 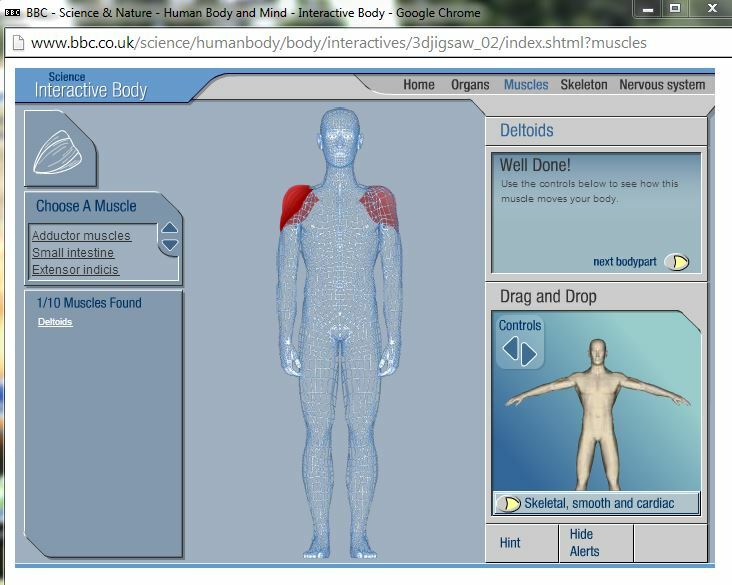 The BBC offers a collection of games or animations on the Anatomy of the Body. Users are asked to move the correct muscle, bone, organ etc. into the correct position in the body. The Drag&Drop function together with helpful clues and hints make it into a real learning tool. The window cannot be enlarged to full screen size. Use Inner Body website if you wish to zoom in on detailed parts of the body while instructing in front of the class. Advertisements appear on the righthand side of the window. However, if you have an Interactive Board you can use the board’s function to cover the righthand part of the screen.